Custom web design & development packages that fits your business. As business you want to stand out from the noise. We know how to make this happen. GoingClear created comprehensive website packages for businesses of all sizes that work just as hard as they do whether it’s a larger corporate entity that wants to stay sharp on a website or a small business that knows design matters and wants something special. Equally important, GoingClear will work with you to tell your story and gain clarity on your goals before we work up a strategy to deliver functional, aesthetically pleasing and robust websites that are vital sales tools for your small business. 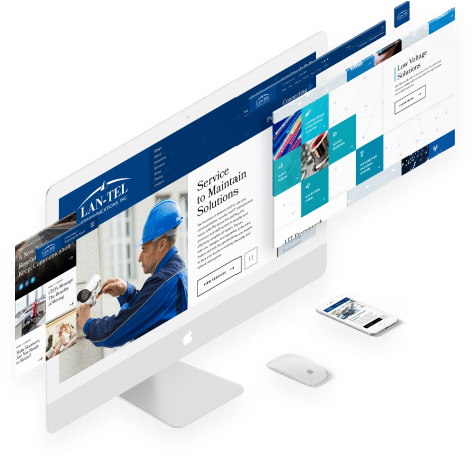 Contact us to see how we can put together a website that can move along with your business goals and your marketing collateral so you’re always one step ahead of the competition. You’ll be setup on a base framework and able to make website updates without having to code. SEO friendly web pages, page titles and other on-site SEO efforts to help with your overall Search Engine rankings. Integrated so you can view website traffic every month to see how you are doing and what tweaks you can make to improve traffic and CRO. Mobile and tablet friendly web design and development included. We fine tune with you. Each of our website packages designs comes with 2 rounds of revisions per page. Find out more about our affordable fixed-price website packages that will provide you the tools and looks to help promote your business in an engaging and effective way all while providing professional, innovative, modern and fresh web design. Perfect for giving you that custom high-end look and feel for your new website, which works great for businesses that don’t require extra pages. A baseline of animations and effects to engage the user. A bump up from our Starter package, this package includes an additional web page and also comes with a Blog / News system for your new website! In addition to starter effects, we also include sticky headers, mouse-over effects, and light parallax effects. A standard blog featuring articles, categories, and search. When you want to get the best business website design and development package we offer, our Plus package is a perfect solution with the most pages! In addition to essential effects, we also include micro-animations that add to the depth of interaction a user loves. An Advanced Blog featuring custom filters, search, sort and more. Need additional pages, functionality, features or customization of your new website? No problem! Learn more about our High-Performance Websites or Web App Development services, or ask our GoingClear Interactive Rep about customizing your new website project to your exact needs!